A refreshingly modest, no-frills movie that is character-driven in the most rewarding possible sense. This constantly surprising character piece should spark deserved awards chatter for Tomlin. Tomlin tient le rôle de sa vie, son humour aigre-doux faisant plus que jamais merveille. 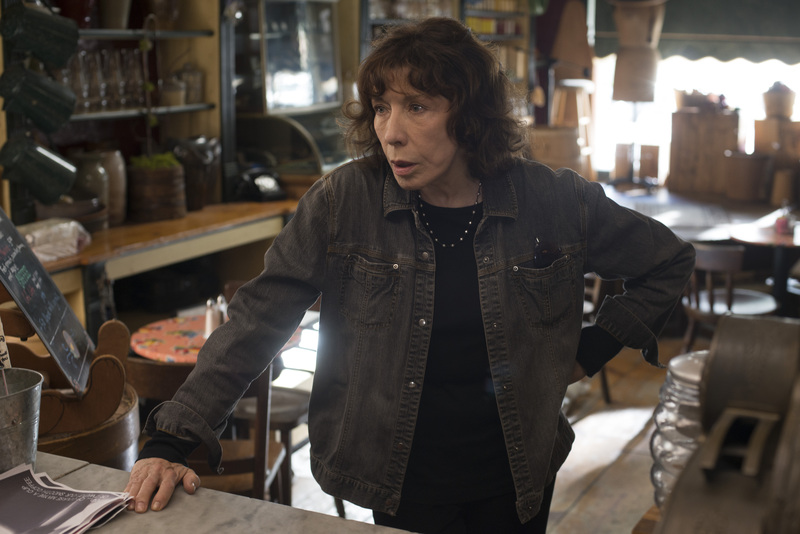 Lily Tomlin trouve le rôle de sa vie à 76 ans dans l'irrésistible "Grandma". 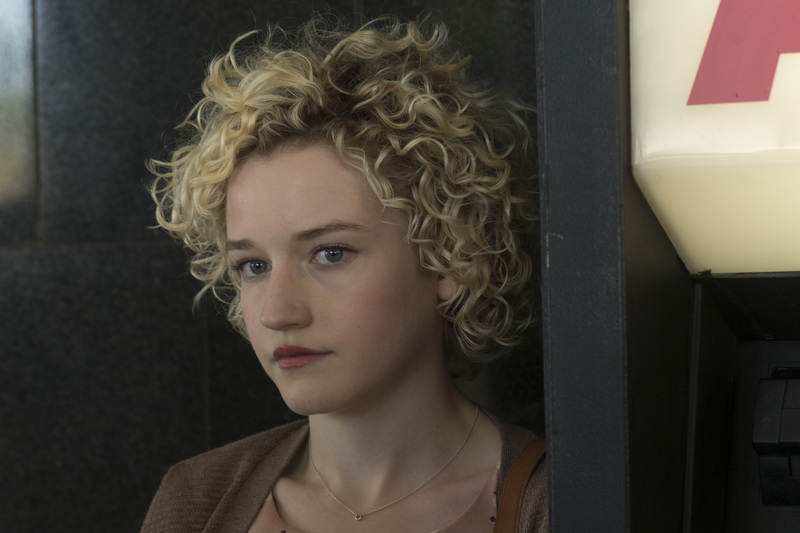 Elle Reid (Lily Tomlin) has just gotten through breaking up with her girlfriend when her granddaughter Sage (Julia Garner) unexpectedly shows up needing $600 before sundown. 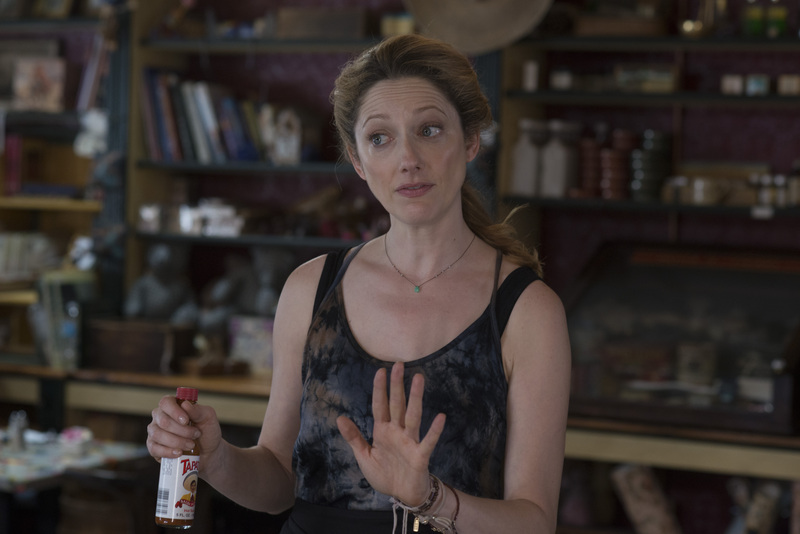 Temporarily broke, Grandma Elle and Sage spend the day trying to get their hands on the cash as their unannounced visits to old friends and flames end up rattling skeletons and digging up secrets. Julia Garner as Sage.Photo by Glen Wilson, Courtesy of Sony Pictures Classics. 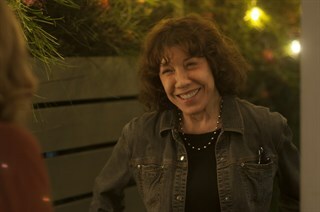 Let to right: Lily Tomlin as Elle and Julia Garner as Sage.Photo by Glen Wilson, Courtesy of Sony Pictures Classics. Left to right: Lily Tomlin as Elle, Nat Wolf as Cam and Julia Garner as Sage.Photo by Glen Wilson, Courtesy of Sony Pictures Classics. Marcia Gay Harden as Judy.Photo by Glen Wilson, Courtesy of Sony Pictures Classics. Judy Greer as Olivia.Photo by Glen Wilson, Courtesy of Sony Pictures Classics. 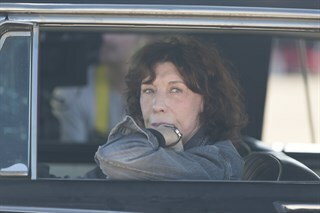 Lily Tomlin as Elle.Photo by Glen Wilson, Courtesy of Sony Pictures Classics. 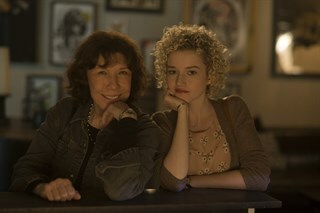 Julia Garner as Sage and Lily Tomlin as Elle.Photo by Glen Wilson, Courtesy of Sony Pictures Classics. 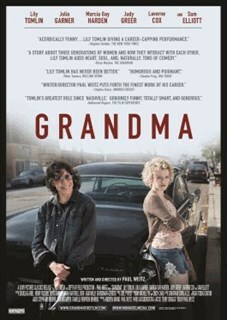 Left to right: Lily Tomlin as Elle and Julia Garner as Sage.Photo by Glen Wilson, Courtesy of Sony Pictures Classics. 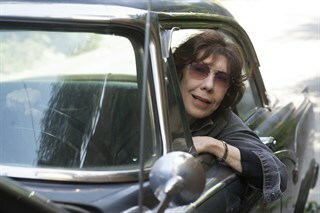 Left to right: Lily Tomlin as Elle.Photo by Glen Wilson, Courtesy of Sony Pictures Classics. 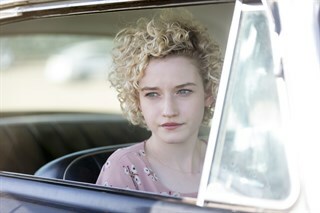 Julia Garner as Sage.Photo by Aaron Epstein, Courtesy of Sony Pictures Classics. Left to right: Julia Garner, Writer/Director Paul Weitz, Lily Tomlin and Marcia Gay Haren.Photo by Glen Wilson, Courtesy of Sony Pictures Classics. Left to right: Marcia Gay Harden as Judy, Lily Tomlin as Elle and Julia Garner as Sage.Photo by Glen Wilson, Courtesy of Sony Pictures Classics. 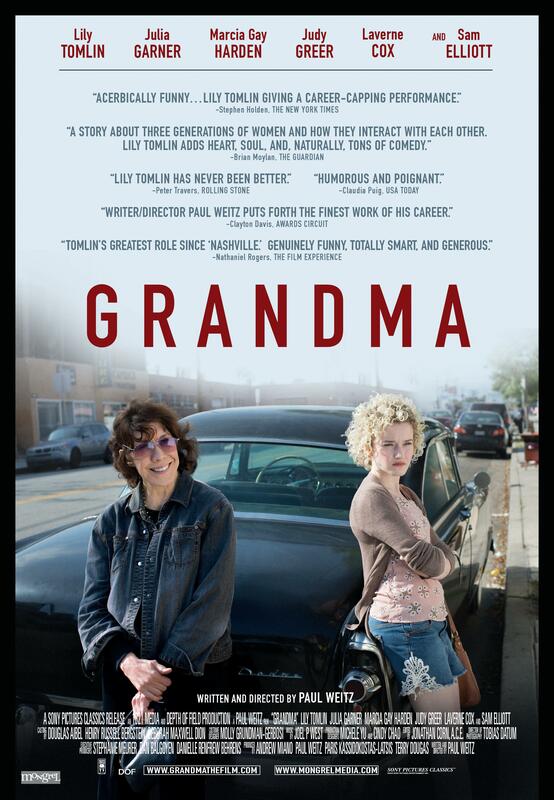 Julia Garner and Lily Tomlin, in Grandma. Courtesy of Sony Pictures Classics. Lily Tomlin as Elle.Photo by Aaron Epstein, Courtesy of Sony Pictures Classics. 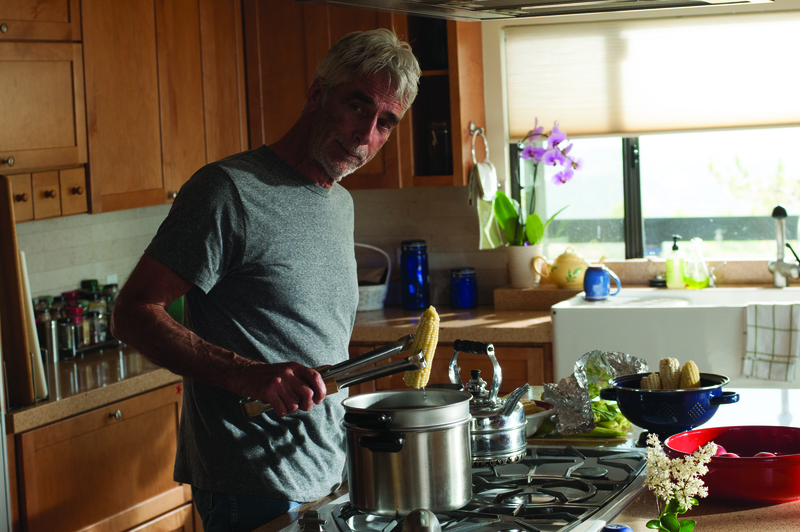 Sam Elliott as Karl.Photo by Glen Wilson, Courtesy of Sony Pictures Classics. 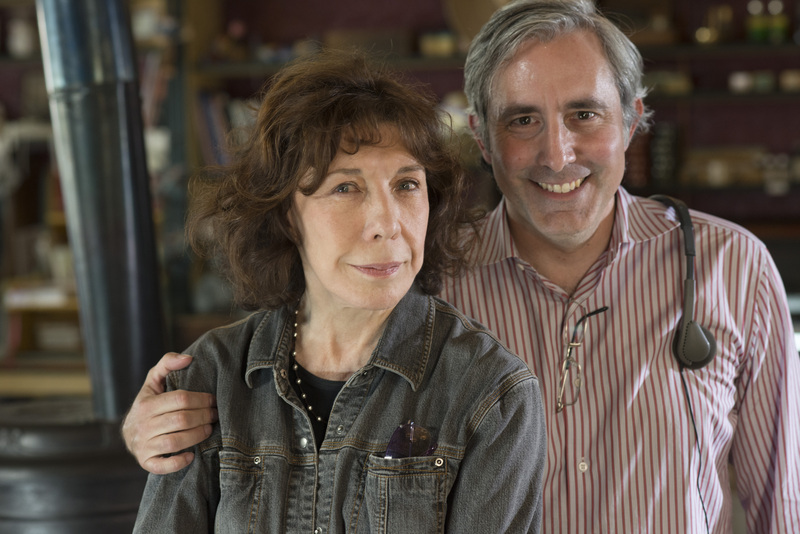 Left to right: Lily Tomlin and Writer/Director Paul Weitz.Photo by Glen Wilson, Courtesy of Sony Pictures Classics. Left to right: Lily Tomlin as Elle and Marcia Gay Harden as Judy.Photo by Glen Wilson, Courtesy of Sony Pictures Classics.